Hello and greetings all reader.. Alot has happen lately. Being an introvert person doesn't mean I dont care about global things. Well I dont really care but still need to know.hahaha...Last few days we been strucked by a tragedy that happen at Paris city of love or well thats what people say at least. This sad tragedy also know as Paris attack and it is beleived that Islamic State ( IS) has been responsible for this tragedy. This tragedy has at least killed 129 people. See the damage is not as high as what happen in Palestine or Iraq or Afghanistan yet who we are to value human life by number. I personally didnt agree with the statement of people who comments about the number of death. Its not funny when you been put on the list of death even in just 2 people list. However this as usual just my thought. This attack consists of mass shooting and suicide bombing. The frances government has declared a state of emergency because of this tragedy.I was surprised when I first hear about this tragedy because who would imagine such tragedy could happen there.However the after effect of this tragedy is terrible physically and mentally. 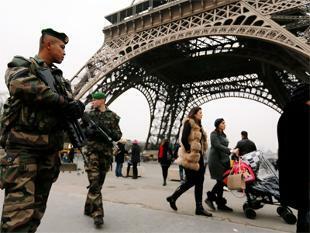 Soldier everywhere after the tragedy..see the magnifienct Eifel Tower there. After this attack some people mourn their lost one and some have been injured by the attacks. Islamic religion were blame as the roots of terrorist. See the effect?its not just what we can see but lots of things change.. Ohh i forgot to mention that after this incident France had bomb Syria which causes lots of fatality as well.Wow such a domino effect.. However I feel it is not smart to blame a religion. Wait wait I'm not sided with any side as I told in my entry before. No religion support this kind of things. However people tend to use religion as an excuse to give advantage for them. Some use religion as a shield.. Realy really bad people. I hope my country Malaysia will not face anything like this. Ok I think that is for now since I need to continue my work and my condolences to those who have lost their loved one in this tragedy.Tell me your though about this tragedy as well..